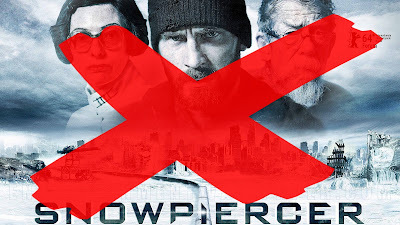 Dear Snowpiercer, I haven't gone in with higher expectations or left with more disappointment in a very long time. This film has some laudable ambition, a solid cast, fantastic production design, and a premise that is interesting and original enough to hold great promise. Apparently, many reviewers really liked it given the film's 84/100 on Metacritic. I can recognize those worthwhile elements. But they absolutely do not add up. The film earns its gory R rating but has some incredibly childish dialogue that belongs in a young adult novel. Yes, Tilda Swinton does very well with her role and there are some other notable successes in the cast (the classroom scene was by far the most well-directed). And Chris Evans carries the film well enough except for a macabre monologue about eating babies (can a good guy ever eat babies?). But not since "The Matrix Reloaded" have I seen such a clumsy, unsatisfying deus ex machina. Ed Harris channels his role from "The Truman Show" here with a fumbling finale that underwhelms and feels almost insulting to sit through. After a two hour train ride, this really isn't where we should be getting off. What's worse, the film is all too eager to kill off basically every character we meet and grow to care about, leaving us with very little worth rooting for when the small band of surviving characters finally escape from their Flakes on a Train experience. And what do we have left? A totally unsurvivable wilderness that cannot possibly sustain these untrained and ill-equipped passengers. Nobody seems to have thought this through - not the characters, not the filmmakers. By nightfall, temperatures will drop and they will desperately flee back into the train they just blew up in order to salvage whatever they can to build a habitable environment in their former prison. Where is Matt Damon from "The Martian" when we need him? So we're left with a trite and superficial meditation on classism and population control, a banal plot twist involving child labor, and a vague cautionary tail against geoengineering. I was truly hoping that the antagonist's big reveal was the frozen landscape being an intentional act by the train's designer to purge humanity and rule the remaining world from within his train car. But what we get is much simpler - and the realization that the film has greatly over-promised and under-delivered.